They're flowing relentlessly, eroding traditional industrial sales terrain, and looking for the path of least resistance. And that's a hard reality in very traditional industrial sales channel circles. Accustomed to controlling access to products, support and even information, many industrial channel partners are experiencing angst as industry changes. Industrial Distribution's 70th Annual Survey of Distributor Operations (available here in part 1, part 2 & part 3) surveyed distributors of various sizes in a variety of industries regarding topics including demographics, challenges, financials, best practices, technology, employment and value of distributor. They almost all buy online but many fewer sell online. They cite price competition as their biggest concern, and buy on price, but claim it's "becoming less of a priority for their customers." Their business growth strategies including increasing marketing and improving websites, but they plan for no staffing to support that. They want to add sales people, and have a hard time hiring and retaining top talent, yet barely invest in tools to help sales people be optimally efficient. 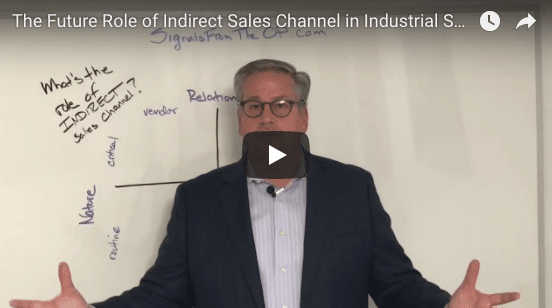 Buyers aren't making decisions based on where they think they fit against a traditional landscape of industrial sales channel. Instead they're going where they get the best insights and experience. But sellers still think it's their line-cards and donut/coffee runs....the "relationships." That means that the opportunity is wide open for manufacturer, distributor or rep to seize. Great sales people armed with great technology; effective, easy-to-use and informative websites; and insights before and after the sale are key. Any company can deliver that based on culture, strategy, management and investment. So channel can keep fretting about manufacturer direct competition or encroaching, competitive distributors. Instead they should be solving for buyer issues - the one's buyers want fixed, not the ones the distributors traditionally pride themselves on solving. Whether you're a manufacturer trying to figure out how to grow consistently or an industrial distributor hoping to stop the bleeding and build a resilient model, you've got to tackle this head-on. You'll find video & transcript discussions of relevant topics on my video blog. The disconnect between how companies sell and how buyers want to buy. The wide open sales channel opportunity. Want to think bigger about your strategy in general? Download this guide which provides a roadmap of questions for managers and directors.